Those considering careers in legal or protective services in Montana can look to the state’s criminal justice schools for educational options. Though Montana boasts a lower crime rate than the national average and a steadily decreasing violent crime rate since 2003, the state’s criminal justice schools prepares students for a variety of career paths in law, crime prevention, investigation and enforcement. Explore the different degree programs criminal justice schools in Montana provide and the careers they prepare students for, including in-state salary data and resources available for prospective students. After Criminal Justice School in Montana: What's Next? 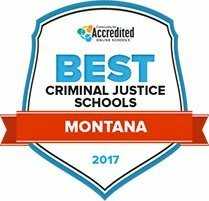 Prospective students might question which criminal justice school in Montana will provide the best education with the most value. As students explore their educational and professional options, they can reference the list below, ranking the best criminal justice schools in Montana based on important factors such as tuition rates, enrollment numbers and student-to-teacher ratios. The two campuses that make up Flathead Valley Community College serve two northern Montana counties with a population of 100,000. FVCC students can find their associate degree to prepare for a four-year education or choose among 50 career and technical programs that ready them for the workplace. Flathead's criminal justice program offers the option of an associate of science or associate of applied science degree. Graduating AS transfer students can complete their four-year CJ degree at The University of Montana _ Missoula or at Montana State University _ Northern. The AAS degree focuses on preparing graduates to take entry level CJ jobs after completing the two-year program. Established as a Montana public community college in 1940, Dawson Community College specializes in a college-transfer education, technical and career training, and continuing education. DCC's 400 undergraduates can choose from 35 plans of study leading to associate degrees, four vocational programs and six online programs. The associate of applied science degree in criminal justice is designed as a pre-academy program offering a curriculum in law enforcement, corrections, probation and parole, criminology, and penology. Graduates can seek entry into CJ roles that do not require academy training, or they may transfer to a four-year CJ program. Long affiliated with Montana's Flathead Valley Community College, Blackfeet Community College became an independent intuition in 1979 in order to provide curriculum in line with its service population. BCC's associate of arts in human services program administers the criminal justice specialization. The two-year program focuses on behavioral, cognitive, and psychological impacts on criminal behavior. Students completing the AA are qualified to take entry level roles in criminal justice or tribal law enforcement organizations. Or, they may transfer to a bachelor degree program in a related field. First-time students who complete their programs in one year are eligible for tuition waivers. Criminal justice classes at the University of Great Falls examine the sociological aspects of the field, guiding students towards the helping nature of their future professions. Students will learn about the different jobs that they can pursue with a criminal justice background, and understand the roles and responsibilities of these jobs. Graduates of the program often find work in law enforcement, private security, corrections, and probation; they also enter graduate study programs in sociology, law, and criminal justice. Students who need assistance can contact the school's student support services department, which offers workshops, mentoring, financial aid counseling, and tutoring. Montana State University _ Northern guides students seeking careers in law enforcement and homeland security through its criminal justice program. Curriculum covers a wide range of topics, from the legal system to crime prevention, with additional training in conflict management and psychology. Instructors are experienced professionals who have held criminal justice roles in rural and metropolitan areas, bringing their experiences into the classroom to help students gage where they would like to work. Both current students and alumni can access the university's career center to reach a network of employment services, from resume and cover letter assistance to on-campus recruiting. The criminal justice program at Montana State University _ Billings leads to an undergraduate degree with a focus on sociology, criminology and ethics, and corrections. Students can also earn a two-year degree with a concentration in criminal justice from MSU Billings City College, a two-year college within the university that offers university transfer and career preparation. This program focuses on basic knowledge of policing, crime, and courts, as well as critical thinking and effective communication skills that benefit a professional in the criminal justice environment. To ensure a successful degree path, students can consult the school's advising services for information regarding required courses for an on-time graduation. Looking for the right criminal justice school in Montana can sometimes feel like a daunting task, but it doesn’t have to be. Find all the options for accredited criminal justice programs in the state with the search option below. This tool can help students narrow down their search based on the criteria that matters most, comparing schools by cost, degree type, acceptance rate and student population. Earning a degree is a big decision, and the best way for students to know if their time, efforts and investment will pay off is to look at their career prospects after graduation. Take a look at the most popular careers for criminal justice school grads in Montana below. Keeping earning potential in mind, each outlines the salaries and amount of jobs available for the top seven careers in the criminal justice field in the state. Those considering criminal justice school in Montana have some positive stats to consider when comparing the state’s legal and protective service workers to national averages. Students enrolled in criminal justice schools in Montana will have some of the following career options available to them—many of which are expected to see significant growth in the coming years. This section breaks down the growth projections for specific criminal justice jobs in Montana compared to national averages, as well as the salaries these workers make. Along with determining a specific field of study at criminal justice school, Montana students can benefit from understanding where their career could take them in the state geographically. In order to make informed decisions about where to earn a criminal justice degree, consider where the top employment areas for criminal justice professionals are in the state. Explore the map below for more details. Serving members in Montana and three other western states, this organization offers networking, service and educational events for in-house corporate attorneys and legal counsel. Job postings, webcasts and a database of helpful forms and checklists is available online to members. A membership organization supporting business across the state, the Montana Chamber offers legal education and advocacy for workers. The group also sponsors the Montana Business Challenge, an eight-week educational business competition for high school and select college students. For legal information regarding businesses in the state of Montana, visit the Secretary of State website. Employment opportunities are also listed on this page. The Montana Women’s Business Center supports female entrepreneurs by networking professionals, providing training, business counseling and mentoring and legal resources. A grassroots group of community members and legal and protective service workers addressing prisoners rights issues and the policies and laws of the Montana justice system. This page provides information about the work of the Department of Corrections, including victim programs, probation and parole and the state’s reentry initiative. Employment and training information can also be found here. This group advocates for a more restorative criminal justice system that rehabilitates incarcerated individuals. They provide information such as crime statistics for Montana along with additional resources, volunteering information, campaigns and training sessions on their website. This page is a useful resource for those interested in juvenile justice by listing information such as youth parole resources, education, employment opportunities and other reintegration strategies. This website provides information on juvenile justice reform in Montana along with current court processes, attorney resources and policy platforms. Provides information on the different courts in Montana’s judiciary, including the district courts and courts of limited jurisdictions. The Montana Justice Foundation provides support to low-income Montanans on civil matters such as landlord-tenant disputes, bankruptcy, housing discrimination and family law cases. Users can find Montana Supreme Court opinions, the court’s docket and legal briefs on this page. This association provides legal professionals with networking opportunities as well as educational seminars and newsletters that uphold legal expectations and fair criminal justice systems. The Montana Bar Association promotes the standards of legal professionals around the state by enforcing rules that govern the field. The Montana Department of Justice includes information on the state’s Montana Department of Justice programs, divisions, and cases that the agency handles. The Montana Legal Services Association provides free or low-cost legal advice and representation for those who cannot afford an attorney. Pro bono opportunities and legal internships are also offered. This agency is charged with providing licenses to private security personnel, including security guards, private investigators, process servers and security alarm installers. The Montana Law Enforcement Academy provides training and education to law enforcement officers on the state, city, county and tribal level. The MTLETC is responsible for testing law enforcement candidates for police agencies around the state. Their website provides information on registering for testing, study guides and other requirements. Since 1930, the Montana Police Protective Association has worked on behalf of the state’s police officers. The association provides advocacy support, events, and news. In addition, the organization offers scholarships and death benefits to the family members of police officers. The Montana Sheriffs and Peace Officers Association provides professional development support—including training on investigative procedures and forensics—to its members. Through education and local advocacy, the MACD works with Montana residents and federal organizations to preserve the state’s natural land and wildlife. The group offers scholarships and grants to students and includes job postings on this website. This agency regulates the state’s hunting and fishing activities, protects wildlife and provides education about fish, wildlife and state parks. Those interested in details on becoming a game warden can find more information here. The Montana Wildlife Federation (MWF) works to conserve fish, wildlife, natural lands and wild rivers. Their website lists information on strategies, laws and employment opportunities to preserve Montana’s natural surroundings and wildlife. A team of attorneys, conservation biologists and policy experts working across four western states, including Montana. The group’s focus is on legal environmental issues at the national, regional, state and local level.